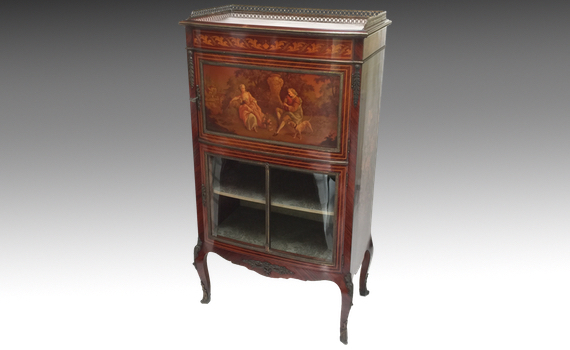 A late 19th century, French, rosewood, marquetry and ormolu mounted cabinet vitrine. The rectangular bow front top with three quarter gallery, above a slim scroll inlaid frieze and single door with vernis martin panel signed ‘Crozet’, a bowed glazed door below. The sides inlaid with floral marquetry, mounted with gilt bronze and standing on short cabriole legs. The panel signed to the lower right ‘Crozet’, the mounts stamped JH to the reverse.